Raith Rovers have hit back at claims that they were at fault after Livingston were locked out of the away dressing room on Saturday – insisting the visitors locked THEMSELVES out. The start of the second half was held up by around five minutes after Livi players were initally unable to gain access to the away dressing rooms at the start of half-time. Livingston issued a statement on their official website claiming the delay was due to Raith staff being unable to find the door key, describing it as an “unfortunate incident”. Match referee Willie Collum also mentioned it in his report, and Raith have been asked for clarification by the SPFL, however club chief executive Eric Drysdale hit back at the suggestions that the club was at fault. “The explanation given by Livingston is not actually what happened,” said the Stark’s Park chief. “Quite simply, an unstripped member of the Livingston party seems to have snibbed both away dressing room doors five minutes before half-time so they couldn’t be opened from the outside. 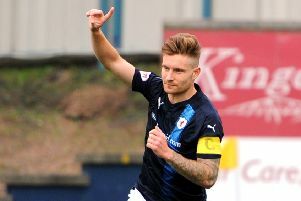 Raith won the match 2-0 thanks to goals from Mark Stewart and Aidan Connolly.